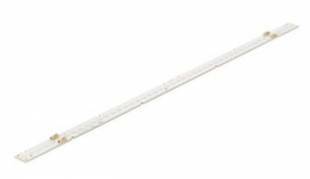 High level of design flexibility through small continuous pitch of LEDs, narrow design with notches available in 102mm and 280mm. Beginning of October we already launched the performance upgrade of the Fortimo LED Strip 102mm 375lm and 1ft 650lm LV. This commercial release targets the extension of the LED Strip range with a HV and LV 1ft 1100lm and 2ft 2200lm LED Strip.Fortimo LED Strip systems are ideal for use in designer or miniaturized, slim linear luminaires for architectural applications, which were not previously possible with fluorescent lighting or Fortimo LED Line. 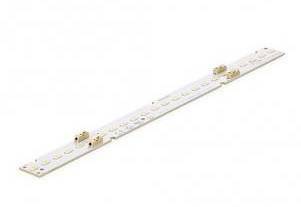 This third-generation LED Strip offers best-in-class module efficiency up to 165lm/w and range extensions with flux packages like those for traditional fluorescent lighting and Fortimo LED Line. The new generation also offers an improved color consistency of 3 SDCM, and cool white CCT 850 and CRI 90 (4000 K) have been added to the standard portfolio. Fortimo LED Linear comes in a HV version, with best efficiency at lowest price, and LV version, with ease of design-in. Both ranges feature a variety of different dimensions, lumen packages and color temperatures. In this guide you will find the specific information required to develop a luminaire based on Philips Fortimo LED Linear system. Product specific data can be found in the associated datasheet on www.philips.com/technology.